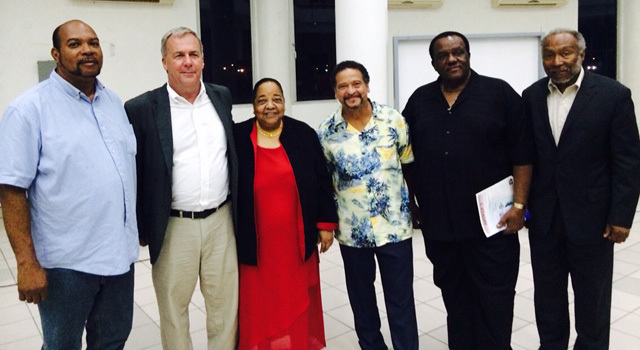 The first event on the speaking tour took place on 4 October in Antigua and Barbuda: Some 70 persons gathered at the Multipurpose Cultural Center in St John’s on Saturday evening to hear a public lecture on the Death Penalty. The event was organised by GCL Member, Sir Clare Roberts, and the Antiguan & Barbudan organization which he Chairs, Human Rights for All. Sir Roberts is also the Deputy Governor of Antigua and Barbuda. He and his team did a great job in advertising the lecture in the Antiguan media. See for instance Sir Clare’s interview on ABS TV. Juan Melendez, a Puerto Rican who spent nearly 18 years on death row in Florida for a crime he did not commit. He was exonerated in 2002. A number of government officials attended the event including the Governor General, Dr. Rodney Williams, the Attorney General, Hon. Steadroy Benjamin and the Director of Public Prosecutions (DPP), Mr. Anthony Armstrong. The crowd also included many university students and the media was well represented. The evening was marked by lively discussion, with a crowd that was generally more in favour of capital punishment, including the Attorney General and DPP who maintained strong positions in favour of the death penalty. The Chair of GCL gave an overview of the death penalty situation in the Greater Caribbean region, listing the many rulings and guidelines by the Judicial Council of the Privy Council which make it almost impossible for the English Speaking Caribbean countries to implement the death penalty. Her concern was that instead of “baying for blood”, many politicians in the region should be devising strategies/implementing policies that will promote respect for life and for the dignity of each person. She highlighted the recommendations outlined in the UNDP 2012 report on Human Development and the Shift to Better Citizen Security which states, inter alia, that countries in our region should develop a better balance between legitimate law enforcement and prevention, with a focus on prevention e.g. through youth development, job creation, addressing poverty and social exclusion. She shared information about the aims and objectives of GCL, stressing that while GCL condemns the rise of violent crime in the region and expresses solidarity and compassion with the victims of crime, Members reject the notion that capital punishment acts as a deterrent or fosters respect for life in our communities; it will not help countries to build safer, more secure communities and will not promote sustainable development. Renny Cushing shared his personal experience as a victim, having lost his father to murder in 1988, and as an advocate for crime victims and for abolition. He stressed that victims’ families were not taken care of by society effectively and tended to focus on basic revenge instead of worrying about helping families cope with their loss. He explained that “another killing by the state is not going to do anything to bring our loved one back. All it’s going to do is to fill another coffin and create another grieving family”. Another powerful testimony was delivered by Juan Melendez who described what it has been like to spend 17 years, 8 months and 1 day on death row awaiting capital punishment for a crime he did not commit. Juan’s story also sheds light on the 146 persons who have been exonerated in the USA alone since 1973. Juan told the audience how his mother, weeping shortly after his release, told him that even though she had been praying for a miracle that he would be released, she had been saving money during all those years to be able to bring his body home: an ordeal that no mother should have to go through.